Justification: Only one class is necessary to keep the update and call the draw function in GameScreen. Description: Represents the entirety of the game’s current state. Justification: Having the entire state of the game represented in one data structure keeps the game engine cleaner and allows other classes such as Physics access it as needed. Justification: Since there are multiple rooms in a level, there should be class that hold room’s state. 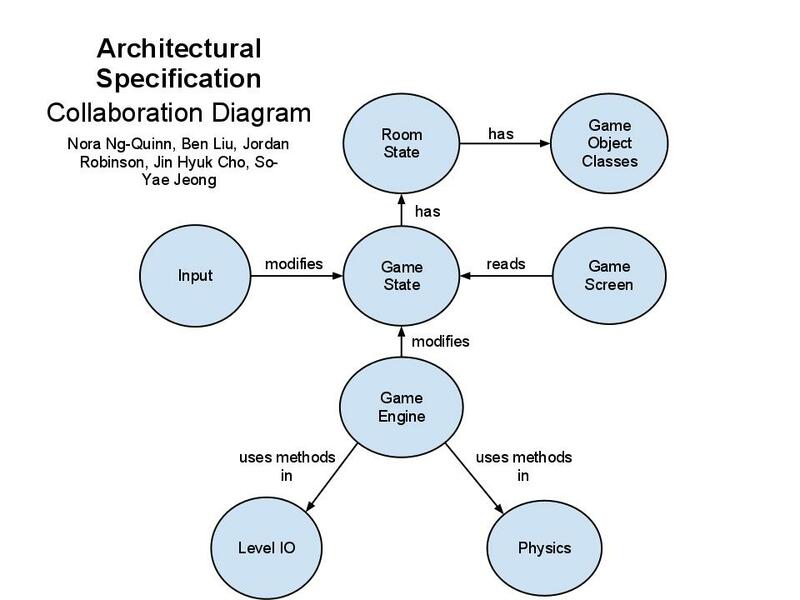 Description: The Game Object class holds data about a game object that will determine how it will be drawn and how it will interact with other objects. Justification: All the information about a game object can be contained in one class and can be easily updated by the Game Engine. Description: The physics class is a utility class that contains static methods that calculate all interactions between game objects as well as the physical effect of a character’s actions. Justification: Should be contained in one class so that all physical constants and calculations can be changed in one place. Description: This class contains static methods to read and write levels. Justification: Reading and writing a level should be contained in one class. Description: Receives user input from the phone device in a controlled way and translates the signals into appropriate changes in the game state. 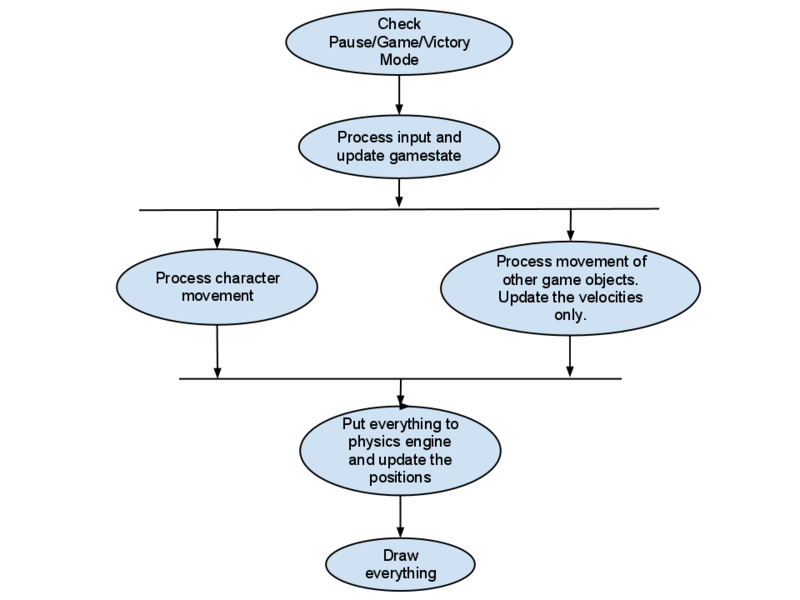 Justification: Having all user input dealt with in one class allows the Game Engine to focus on performing updates. Description: The game screen draws all visual components of the game. Justification: All of the drawing and necessary parameters will be contained and controlled in one class. Allows the game to perform any initialization it needs to before starting to run. and initialize them as well. and creates a new instance of Level. checking for collisions, gathering user input, and playing audio. Modifies the velocity of game objects. Updates game object’s position according to its velocity. Influences the octopus character with acceleration. This takes into account user input, collisions as well as currents. Influences object with friction, dampens horizontal movement. Detects if obj1 and obj2, given their current trajectories, will collide with one another. Resolve the collision of two objects that are about to strike. Calculate as if they have already struck each other. Given requests from the Editor’s GUI, update the coral’s properties appropriately. Given requests from the Editor’s GUI, update the current’s properties appropriately. Add the requested object to the level. Adds the GameObj, its body, as well as all of its shapes into the world. Zoom out of the given level. Zoom back into the level. Center the camera on the character without allowing parts of the screen that are not level to be shown. Draw the given level to the screen. Sets the fields that represent the current state of a room. Returns the fields that represent what is currently happening in the game. Sets the fields that represent what is currently happening in the game. Represents: The level file contains the initial layout of a level. We will use Libgdx’s Box2D functionality to detect all collisions and simulate the physical collision. For collisions that have consequences that are not implemented in Box2D, such as capturing fish, we will use the Physics class to process them.